January 6, 2011 - The National Transportation Safety Board on Wednesday issued two safety recommendations to the Federal Aviation Administration requiring a detailed inspection of all emergency locator transmitters (ELT) installed on general aviation aircraft to ensure that their mountings maintain their retention capabilities during an accident sequence. An ELT is designed to broadcast a signal through an externally mounted antenna that contains the aircraft's registration information and the global positioning system coordinates of the original signal. Also, the "homing signal" can be detected locally by other aircraft, air traffic control facilities, or rescue personnel who use a compatible receiver. "In this case, the airplane was equipped with a functioning 406 megahertz ELT, which can be a tremendous aid to search and rescue operations," said NTSB Chairman Deborah A.P. Hersman. "But this vital life-saving technology won't do anyone any good if it doesn't stay connected to the antenna." On August 9, 2010, about 1442 Alaska daylight time, a single engine, turbine-powered, amphibious float-equipped de Havilland DHC-3T airplane, N455A, impacted mountainous tree-covered terrain about 10 miles northeast of Aleknagik, Alaska. Of the nine people aboard, the airline transport pilot and four passengers died at the scene, and four passengers sustained serious injuries. The airplane sustained substantial damage. The flight was operated by General Communication, Incorporated (GCI), Anchorage, Alaska, under the provisions of 14 Code of Federal Regulations (CFR) Part 91. The flight originated at a GCI-owned remote fishing lodge on the southwest shoreline of Lake Nerka about 1427 and was en route to a remote sport fishing camp on the banks of the Nushagak River, about 52 miles southeast of the GCI lodge. At the time of the accident, marginal visual meteorological conditions were reported at the Dillingham Airport, in Dillingham, Alaska, about 18 miles south of the accident site; however, the weather conditions at the accident site at that time are not known. No flight plan was filed. About 1815, GCI?s onsite lodge manager contacted the fishing camp to inquire about the airplane's proposed return time and was told by fishing camp personnel that the airplane had not arrived. The lodge manager attempted to contact the pilot by phone and radio. Lodge management personnel were unable to locate the airplane and initiated an aerial search along the pilot's anticipated route. Additional personnel in airplanes and helicopters voluntarily joined the search for the missing airplane. The airplane was officially reported overdue to the FAA at 1859. The de Havilland DHC-3T airplane was equipped with an Artex ME406 ELT, which was designed to broadcast a 406 megahertz (MHz) signal, via an externally mounted antenna, that contained contact information for the airplane owner and the global positioning system coordinates of the originating signal. When activated, the signal would be received by orbiting satellites and relayed to appropriate rescue organizations. In addition, the ME406 ELT would broadcast a 121.5 MHz ?homing signal? that could be detected locally by other aircraft, air traffic control facilities, or rescue personnel who use a compatible receiver. An ELT is activated automatically by crash forces and then transmits radio signals containing the airplane?s identification and location, which are used by search and rescue organizations. 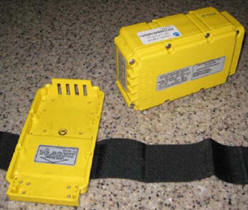 These transmissions are a key component in the rapid location and rescue of passengers once an accident has occurred. About 1930, volunteer airborne search personnel located the wreckage near the anticipated flight route, in steep, heavily wooded terrain, about 19 miles southeast of the GCI lodge. After the search team located the wreckage site, the weather deteriorated. Poor weather and night conditions prevented military pararescue personnel from reaching the accident site until the following morning when they transported the passengers from the scene. The pilot and four passengers, including former U.S. Senator Ted Stevens, sustained fatal injuries. The other four passengers were seriously injured. 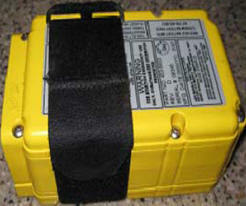 During its investigation of an amphibious float-equipped de Havilland Dash-3T (DHC-3T) airplane accident, the National Transportation Safety Board (NTSB) found that the emergency locator transmitter (ELT) became dislodged from its mounting tray, detached from its antenna, and failed to transmit radio signals to alert personnel of the downed airplane. Aircraft involved in the search and rescue efforts and satellites did not detect any ELT signals. 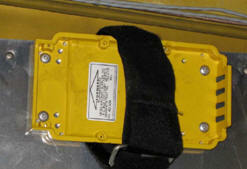 A pararescuer found the ELT loose on the floor of the airplane. The ELT had activated but had separated from its mounting bracket and antenna. Pararescuemen are United States Air Force Special Operations Command (AFSOC) and Air Combat Command (ACC) operatives tasked with recovery and medical treatment of personnel in humanitarian and combat environments. They are the only members of the DOD specifically organized, trained and equipped to conduct personnel recovery operations in hostile or denied areas as a primary mission. Also known as "PJs" (Para Jumpers), these special operations units are also used to support NASA missions and have been used to recover astronauts after water landings. They are attached to other SOF teams from all branches to conduct other operations as appropriate. Of the 22 enlisted Air Force Cross recipients, 12 have been awarded to Pararescuemen. They wear the maroon beret as a symbol of their elite status. Part of the little-known Air Force Special Tactics community and long an enlisted preserve, the Pararescue service began commissioning Combat Rescue Officers early in the 21st century. An NTSB investigator and Artex personnel examined the ELT unit at Artex facilities in Prescott, Arizona, on August 25, 2010, and found no physical damage to the ELT tray or module. Personnel also conducted electrical examinations of the ELT module, and determined that the 4 121.5 MHz and 406 MHz beacons and the G-switch4 operated normally. The precise reason that the ELT did not remain attached to the airplane is not known. However, it is possible that the ELT was not installed correctly, either at the time of installation or after the periodic inspections. A number of ELT manufacturers5 employ mounting designs similar to the one used for the Artex ME406; the ELT unit is attached to a mounting tray by various types of straps. In all cases, the retention capabilities of each system are dependent on proper installation, and any looseness or misalignment of the retention strap would increase the chance of accidental detachment of the ELT. The NTSB concludes that proper installation and inspection of ELT units is imperative to ensure they remain connected to the antenna and maintain functionality for rapid notification of aircraft accidents and prompt emergency response. Because so many ELTs employ a mounting strategy similar to the Artex ME406, the NTSB is concerned that others may not be properly mounted or are otherwise at risk of being thrown free of their mounting trays. Although the FAA requires an annual ELT inspection to check for proper installation, these inspections may not detect subtle changes in strap tightness or misalignment. The NTSB concludes that a thorough inspection of all installed ELTs could identify and correct any existing mounting problems. Because of the critical importance of having an operational ELT, the NTSB recommends that the FAA require a detailed inspection, during annual inspections, of all ELTs installed in general aviation aircraft to ensure that the ELTs are mounted and retained in accordance with the manufacturer?s specifications.